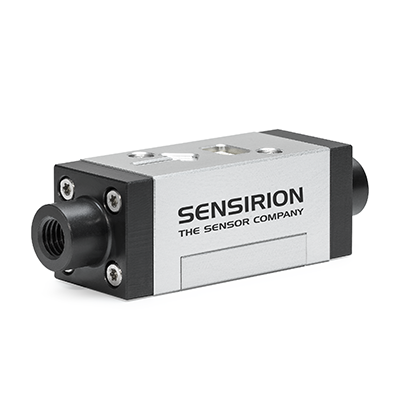 Sensirion AG, the manufacturer of digital microsensors, is expanding its range of liquid flow sensors for measuring low flow rates. The new LS32‑1500 liquid flow sensor is designed for flow rates of 0-40ml/min, extending the range of potential application areas over the successful LG16-series. A completely redesigned housing enables a compact size of 18 x 18 x 59mm and ensures mechanical robustness. Its fast response time of 30ms, excellent repeatability and outstanding chemical resistance makes the sensor suitable for use in biomedical applications, such as diagnostic analysers. The LS32‑1500 sensor is suitable for use in fuel cells, for example, as well as a wide range of applications in dosage control and industrial automation monitoring. The sensor is completely non-invasive; the MEMS chip is located on the outer wall of a capillary and measures through the wall of this channel (US Pat. 6,813,944). The wetted materials are composed exclusively of high-performance stainless steel, PTFE and PEEK, which ensure outstanding biocompatibility and chemical resistance. Customized solutions (eg, a downmount version for manifolds) based on the LS32‑series are also possible.